Diesel Technology: We work with a number of world-renowned research institutions jointly designed using CAD / UG-D technology and CAE analysis technology,an important part of a comprehensive optimization, using world-class analog technology with leading airway perfect combination of combustion theory, built up leading product technology platform. Structure: Multi-skirt and high-intensity arc to strengthen the structure of the structure of the dry cylinder liner, wet cylinder under high bearing technology, the overall head low eddy current inlet, which greatly improves the overall rigidity. Pistons forced cooling technology, two-valve, or two kinds of four-valve arrangement, effectively improve the intake air and emission levels. Four-cylinder engine equipped with a built-in dual-axis cylinder balance system, the machine vibration is reduced to the best level. 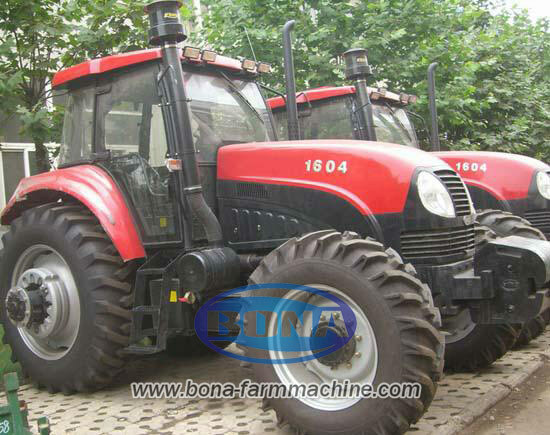 Based on European and American technologies, the diesel engine of agriculture tractor is powerful and fuel efficient. Our wheeled tractor can supply sufficient tractive force to move large implements. Hydraulic steering together with small turning radius makes our wheel tractor maneuverable and flexible in steering.